What Is Blood And What Are Its Different Components? For the longest time, humans have been intrigued by blood, and this fascination has manifested in many interesting ways. For example, back in the day, Greek soldiers drank the blood of other fallen soldiers, thinking that it would give them the dead man’s strength! However, a lot has changed since then; we now know a lot more about the foundational fluid of life—blood! Blood is a life-saving fluid that, in higher evolved animals like humans, moves throughout the circulatory system. It is a fundamental component of the human body, and an adult body carries close to 4 or 5 liters of blood. Blood from arteries is scarlet red in color, while blood from the veins is purple-red, due to its carbon dioxide content. However, if you see someone hurt and oozing blood, you will only see the basic red color, so you might not be able to determine if it’s from the arteries or veins. This blood moves from the central pump (the heart) to the entire body through a huge network of arteries, veins, and capillaries. While doing so, it comes in contact with close to 4.5 trillion cells of the human body, providing them with oxygen and nourishment, and functioning as a transport medium for their waste products to be excreted. Blood and its many names and functions! Blood carries out multiple functions in our body and is called the fluid of life, given that it carries oxygen from the lungs to all the cells and transports carbon dioxide back to the lungs. It transports nutrition from the digestive system and hormones from the endocrine system. Nutrients and hormones are responsible for growth, so blood can also be called the fluid of growth. 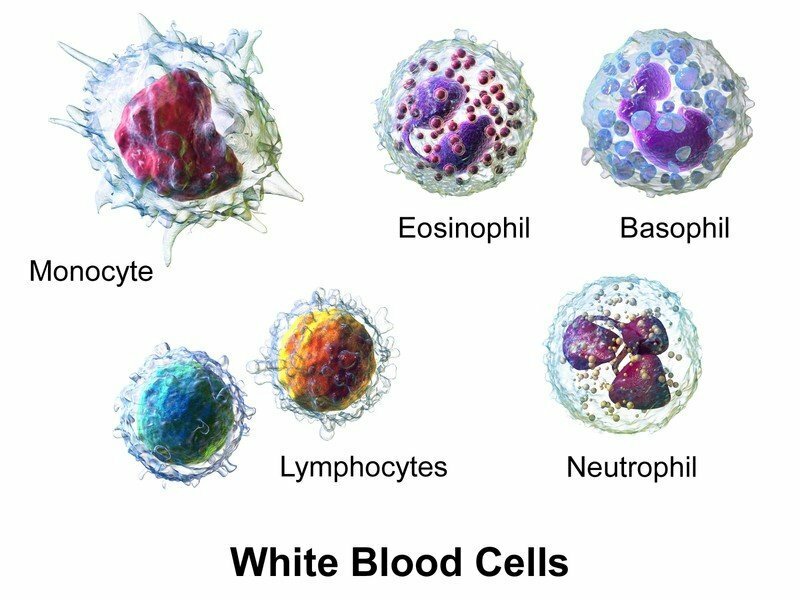 If an infection attacks the body, blood ensures that the white blood cells or fighter cells of our body reach the site and kill the infection, so blood can also be the fluid of health. Blood acts as a reservoir of water, glucose, sodium and potassium; whenever our bodies are under stress or distress, in situations such as electrolyte loss or starvation, these substances can be pulled from the blood. The water content in blood is readily interchangeable with interstitial fluid, so blood helps in regulating the water content of our bodies. 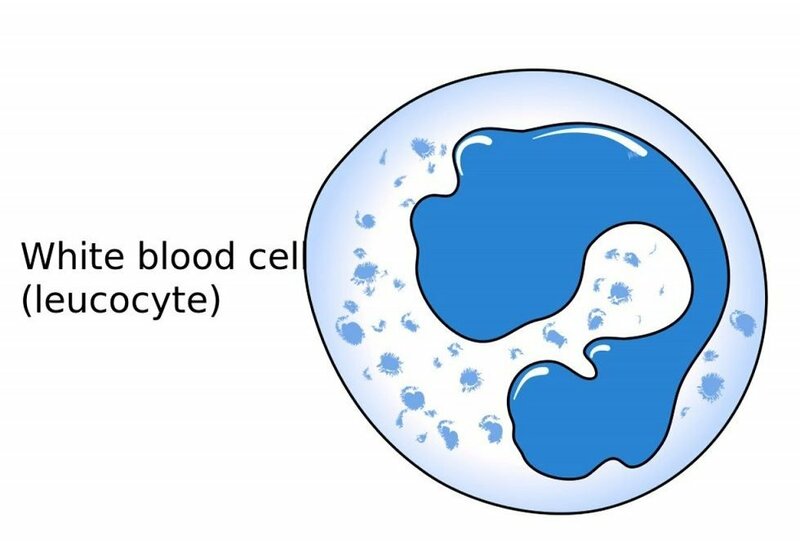 These blood cells are formed in the stem cells of the bone marrow; once formed, they are released into the bloodstream to perform their designated specialized functions. There are other organs, such as the spleen and liver, that help regulate the formation/destruction of blood cells. The process of the formation of blood cells is called hematopoiesis and the stem cells they are formed from is called the hematopoietic cell. Fun fact—adult marrow contains about 1,000,000,000,000 hematopoietic cells! If you collect blood and store it in a test tube for 30 minutes, it will separate into 3 layers of plasma, white blood cells, and red blood cells. Plasma is a clear, straw-colored liquid in which the blood cells are suspended. It makes up about 54% of our blood. The composition of the plasma is 91%-92% water, while the rest is made of organic and inorganic compounds necessary for sustaining life. These solid materials include proteins, carbohydrates, enzymes, fats, sodium, calcium, potassium, chloride, phosphate, iodide, iron and copper, amongst others. All these compounds are required in the right amounts for bodily balance to be maintained. Red blood cells (RBCs) are the most common type of blood cell, with each cubic mm of blood containing about 4-6 million cells! To match this huge quantity of RBCs, our stem cell factory produces about 2-3 million RBCs every second! It’s difficult to even imagine this type of speedy production happening in some tiny stem cell of our body, but it’s true! RBCs are also called erythrocytes, as erythros means “red”. This red color of the RBCs is due to the presence of a coloring pigment called hemoglobin. Hemoglobin is an iron-bearing protein that helps to transport oxygen and thus helps RBCs transport respiratory gases. In other words, RBCs are an army of oxygen-carrying soldiers that take oxygen to all parts of the body. Equal and fast diffusion of oxygen through its surface. Providing a large surface area for absorption and removal of substances. Now, in mammals, with the exception of the camel, RBCs are without a nucleus, and since there is no nucleus, there is also no DNA, mitochondria, Golgi bodies or other organelles. Due to the absence of mitochondria, the energy that RBCs need will come from the glycolytic process of the body. Why do we even need RBCs? RBCs constitute about 45 percent of the blood, so they must be there with some purpose to serve. Some of the most important reasons are below. Transport of respiratory gases – As mentioned earlier, RBCs contain hemoglobin, which combines with oxygen and forms oxyhemoglobin. Almost 97 percent of oxygen is transported as oxyhemoglobin. Hemoglobin, in a similar fashion, combines with carbon dioxide and forms carbhemoglobin; about 30 percent of CO2 is transported in that form. Determination of blood groups – RBCs carry blood group antigens, which help us determine blood groups and also prevents fatal, ghastly reactions due to incompatible blood transfusions. Imagine what a disaster that would be! What happens to old RBCs? – oh, wait they have a graveyard! RBCs are definitely not immortal; their average lifespan is a mere 120 days. After 120 days, the old or “senile” RBCs have cell walls that are aging and increasingly fragile. Usually, the capillaries that RBCs pass through have a diameter that is less than or equal to the RBCs. Younger RBCs usually have no problem passing through these tiny capillaries; the older ones, however, suffer damage while passing through these tiny vessels, owing to their fragile cell walls, and often die. 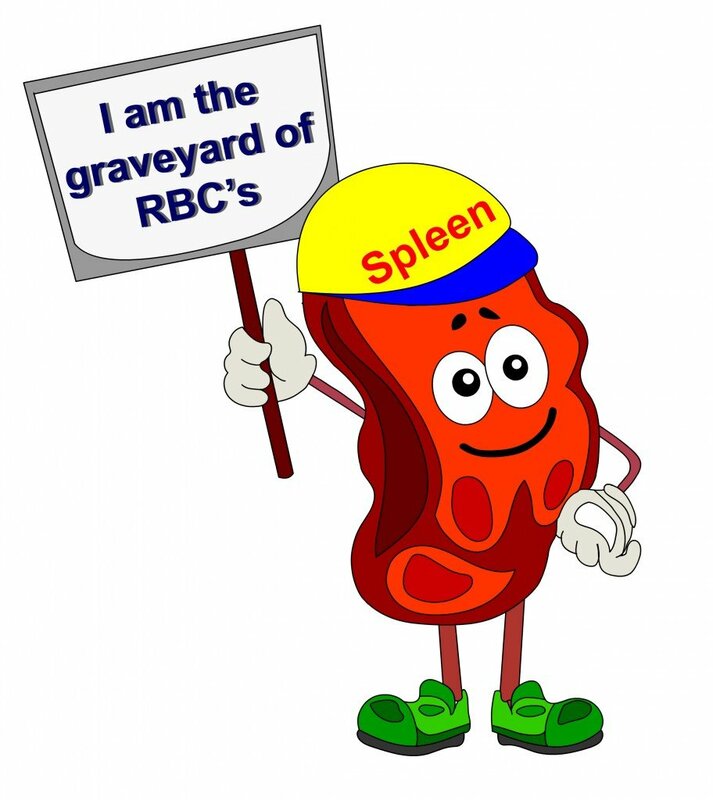 This usually happens in the capillaries of the spleen, as they are extremely small, so the spleen is also referred to as the graveyard of RBCs! The granulocytes, which include the neutrophils, eosinophils, and basophils. They have a lobed nucleus and granulated cytoplasm. The agranulocytes, which include lymphocytes and monocytes. The granulocytes are usually the first response team to the site of an infection. Neutrophils contain enzymes that digest bacteria. There are two types of lymphocytes—T cells and B cells. Once an infection triggers these cells, the B cells produce highly specific antibodies that help combat the infection, while the T cells, also called helper T cells, secrete chemicals that stimulate other immune cells to arrange a coordinated attack. Monocytes, on the other hand, become macrophages and engulf pathogens. Why do we need WBCs? Imagine being struck down by a viral infection or a severe bout of bacterial gastroenteritis. The first cells of the body to be alerted are the leukocytes. They protect our bodies from invading pathogens by either destroying them or inactivating them. Neutrophils and monocytes work together as the first line of defense against invading microorganisms. Eosinophils play an important role against parasites and also help fight allergies. Basophils increase in number whenever there is a healing process initiated in the body, as they contribute to the healing process in a positive way. All types of WBCs, in some way or another, are responsible for our good health, immunity and well-being. Platelets are colorless, non-nucleated elements of the blood that exist in various shapes. They may be spherical, rod-shaped, oval, comma-shaped or even cigar-shaped! 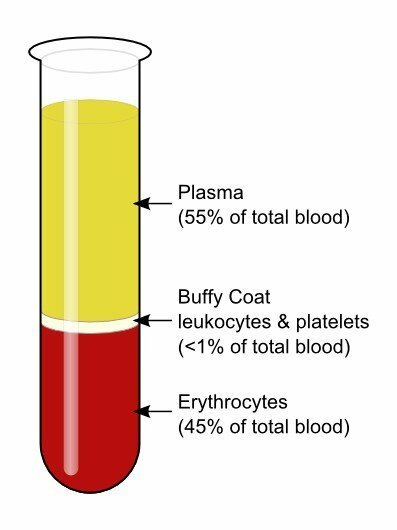 For every cubic mm of blood, the normal platelet count ranges from 200,000 – 400,000 platelets. Platelets also originate from stem cells, which differentiate into megakaryocytes and then shed platelets into the bloodstream. These platelets circulate in the blood in an inactivated state and execute their functions only when triggered. The average lifespan of platelets is about 9 days, unless they’re triggered by an injury, and they typically die a natural death in the spleen. Why do we need platelets? Ever wondered what happens when you get your hand pricked for a blood test or when you hurt yourself and start bleeding? How does blood know when to stop oozing out? When you hurt yourself, you bleed, but you don’t bleed endlessly. Your blood always clots and prevents you from bleeding out. 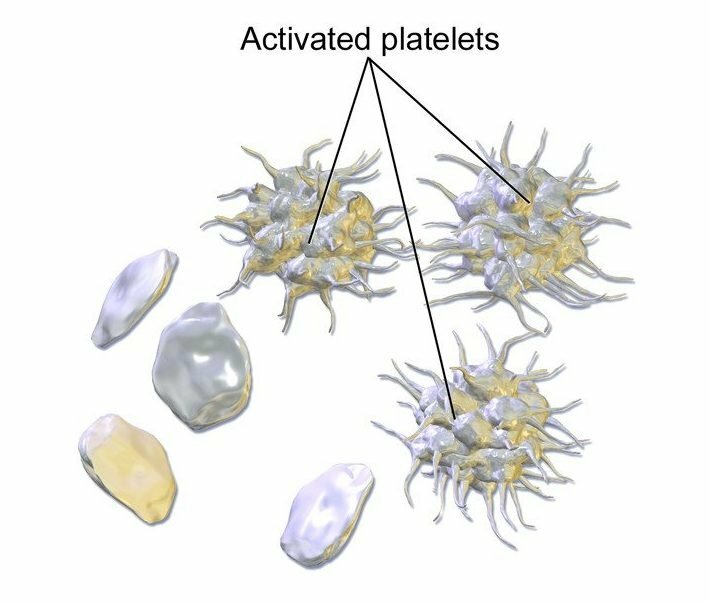 This life-saving mechanism in place thanks to the platelets. Whenever there is an injury, the inactivated platelets are triggered into action and they rush to the site of injury. 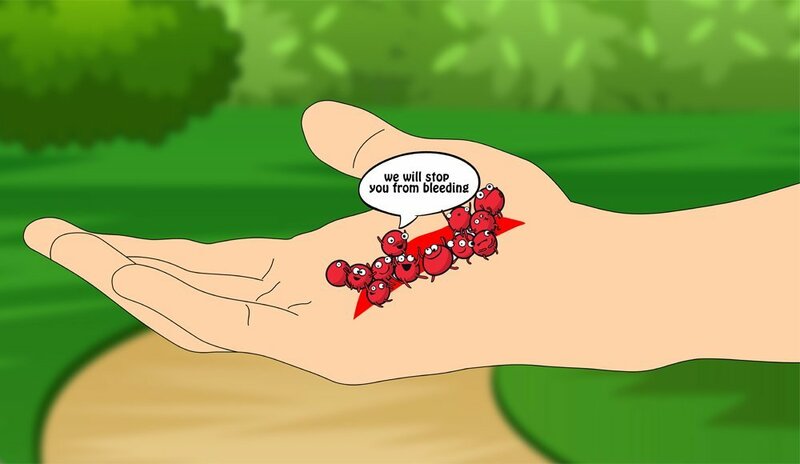 Once they arrive, they stick to the injured site and form a clot, thereby preventing further bleeding. In short, you can think of platelets as natural Band-Aids in our bodies that stick to the area of injury in order to stop blood loss. 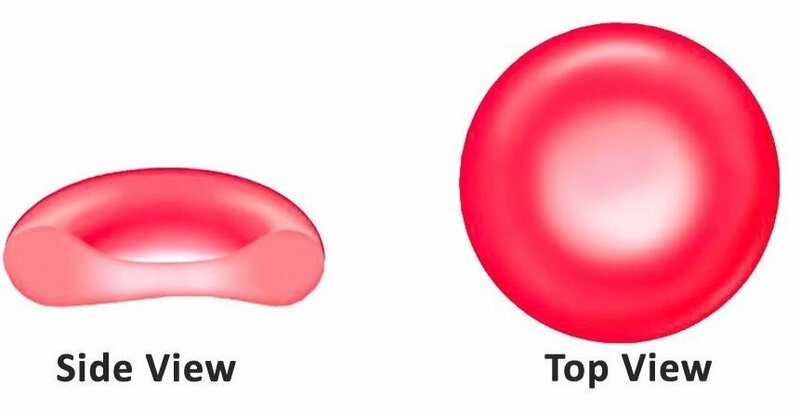 Clot formation is not the only way in which they stop bleeding; platelets are also responsible for hemostasis (prevention of blood loss) by secreting chemicals like 5-HT, which cause blood vessels to close down or constrict. Platelets also contain platelet-derived growth factors (PDGF), which help to repair the ruptured blood vessels. What do these blood cells signal about our well-being? Often, when we’re sick or low on energy, one of the first blood tests our doctors will advise us to take is the Complete Blood Count (CBC). A CBC is a screening test for any type of disorder related to our blood cells and it can immediately indicate or help diagnose a medical condition we may be suffering from. For example, if a CBC indicates that you have a low volume of RBCs, you may be suffering from some form of anemia in which your body’s ability to deliver oxygen might be compromised, owing to reduced RBC number. Abnormalities in the shape, size and number of WBCs indicates that your body is fighting an infection that could be as small as an allergy, or as large as a life-threatening condition like leukemia. Problems with platelets indicate bleeding disorders, wherein you might bleed excessively in response to even a minor injury. To conclude, even though these blood cells and components are tiny components in our body, they have very specific functions that help sustain life. Having a general overview of these blood components can help paint a more complete picture of our health via a simple process like the complete blood count blood test! Dr. Maneka Vig is an experienced dental surgeon with 8 years of dental practice behind her. She completed her Bachelors in Dental Surgery (BDS) from Maharashtra University of Health Sciences in India and ran her own dental practice for many years. She then spearheaded the branch operations for one of India’s largest dental chains as a head dentist for a designated branch wherein she was responsible for rendering treatment, managing operations of the practice and headed a team of efficient doctors. Being passionate about science and academia, she ventured into medical writing and worked with a reputed healthcare communications firm.